Penguins captain Sidney Crosby hoped to wait until CONSOL Energy Center was completely finished before he stepped foot inside the Penguins’ new home. With most of the major construction complete outside of a few nuts and bolts here and there, the Penguins superstar made his first visit to the arena on Tuesday afternoon, as he and Penguins Hall of Fame owner Mario Lemieux christened the ice surface. Crosby and Lemieux became the first people to skate at CONSOL Energy Center when they each hit the ice together shortly after 2 p.m. The pair emerged from the Penguins locker room in their warmup gear, walked to separate doors on the Penguins bench and skated onto the ice in unison as Penguins’ employees and construction workers looked on. For Lemieux, it was the culmination of all the years of hard work he and his ownership group devoted to make the CONSOL Energy Center a reality for the city of Pittsburgh, while Crosby was appreciative to have the chance to be one of the first people skate on the CONSOL ice. 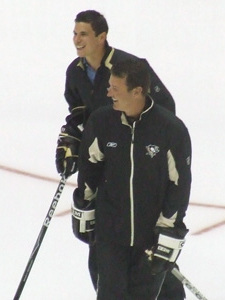 After Crosby and Lemieux spent their first couple minutes skating and stretching by themselves, with much of that time spent taking in the new scenery, the pair came together to skate a few more laps as they discussed what they liked about the new building. Besides how beautiful the arena looked from ice level, and much like Lemieux, Crosby was also blown away by how close the fans are going to be to the action. Once Crosby and Lemieux were done taking everything in, a couple pucks were tossed onto the ice for them to pass around and shoot into the empty nets. About five minutes after Crosby and Lemieux hit the ice they were joined by several children who were divided into two colors – black and gold – with either ‘Crosby 87’ or ‘Lemieux 66’ on the back. The children skated with Crosby and Lemieux for the next 45 minutes, passing pucks and trying to beat them one-on-one. A couple lucky kids even had the chance to take a few shots at Lemieux, who playfully stood in the crease putting on his best Marc-Andre Fleury impersonation. Crosby said sharing such a special moment with the children who have helped make the Penguins such a popular brand and the construction workers who helped make the CONOSL Energy Center a first-class facility added to the day’s event. Following the skate Crosby and Lemieux embarked on a tour of CONSOL Energy Center, and just like they did when they were skating earlier, they came away impressed with what the building has to offer. “I think it is a totally different building (than Mellon Arena),” Lemieux said. “I think that the sight lines are incredible for fans. There is not a bad seat in the house. It is a little bit brighter here. It’s just an incredible building. And thanks to Crosby and Lemieux, Tuesday’s first skate at CONSOL Energy Center was certainly the first of what figures to be many – in the words of the great Badger Bob Johnson – great days for hockey.